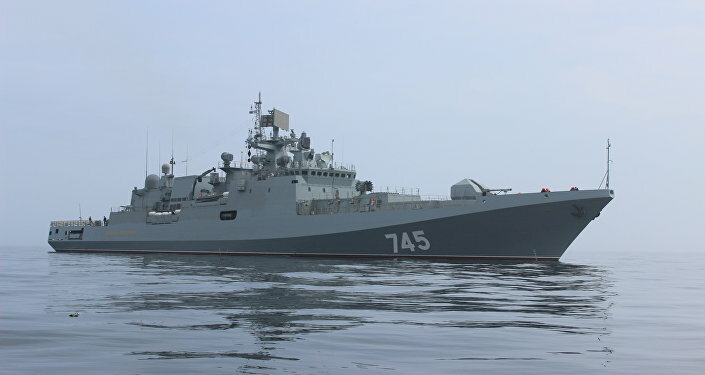 MOSCOW (Sputnik) — The Russian Admiral Grigorovich frigate equipped with Kalibr cruise missiles, as well as the Vice Admiral Zakharin sea thawler and the Raptor patrol vessel participated in the drill. From the Turkish navy, the Barbaros fiegate and the Büyükada corvette participated in the joint exercises. "As part of the drill, ships of the two countries practiced… exit from a naval base, joint maneuvering and communication, as well as repelling an attack of a small-sized high-speed target, an inspection operation, search for and rescue of a person in the water," Trukhachev told reporters. The exercise was held on Wednesday after the visit of the Turkish ships to Novorossiysk. Earlier, the Admiral Grigorovich frigate participated in the operation of the Russian naval group in Syria led by the Admiral Kuznetsov aircraft-carrying cruiser. Kalibr cruise missiles were launched from the warship on terrorist targets in November 2016. After Moscow had started the reduction of its combat group in Syria, the Admiral Kuznetsov naval group had been the first to sail back.